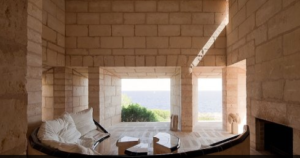 One of Utzon’s most important works is a house he designed for himself and his family near Petro Porto on the Spanish island of Majorca, off the Mediterranean coast near Barcelona. The house is one of those extremely rare, successful essays in the conscious production of a vernacular building by a professional, and appropriately a significant example of Utzon’s understanding of sun and daylight. Not so long ago, the production of (vernacular) buildings, the control of daylight, and thermal control were one and the same. There were no mechanical or electrical means for providing visual or thermal comfort. At this house, which Utzon called Can Lis, he developed a most interesting approach to daylighting, one which, in a vernacular manner, guided his design decisions throughout the project. Utzon’s daylighting strategy at Can Lis recognizes three ideas. The first is that a little sunlight goes a long way. For the most part, direct sun is visually uncomfortable and inefficient and the same is true thermally; it is typically a mistake to bring quantities of uncontrolled direct sun into a space. Direct sun is fine if you are lazing on the seashore or enjoying a leisurely stroll. But too much sun, even a little sun from the wrong direction, easily introduces glare and overheating to a building interior. Utzon’s second idea was that views of sun-washed and daylight-washed surfaces and landscapes can bring the satisfaction of sunlight and a sense of the passage of the day into a space while minimizing the visual and thermal problems. Seeing the unmistakable evidence of sun on a nearby surface or in the distance is a very effective substitute for being exposed to direct sun. 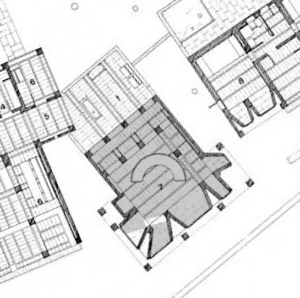 The third and crucial idea was Utzon’s recognition that in Spain the sun follows a relatively high arc through the southern sky (at least in comparison to his native Denmark) and therefore configuring and locating the house’s openings toward the horizon would minimize the attack of direct sun and maximize the intake of more desirable, diffused skylight.